We are really looking forward to the touring ahead, and there is a lot of it. Concerts start tonight, with the annual Yellow Room Gang show at The Ark here in Ann Arbor. www.theark.org We just did another show with the Gang that has become a tradition: we brought in the New Year in Flint, MI. Both Michael and I are always overwhelmed when we do a show with the Gang. Everyone is that group is superlative in every way, and when all that energy comes together, it is so fun and funny and poignant. Thank you again Flint, we had a blast. And if you can make it tonight, I am urging you to…it is always an event when The Gang plays…and a great way to kick off the new year. 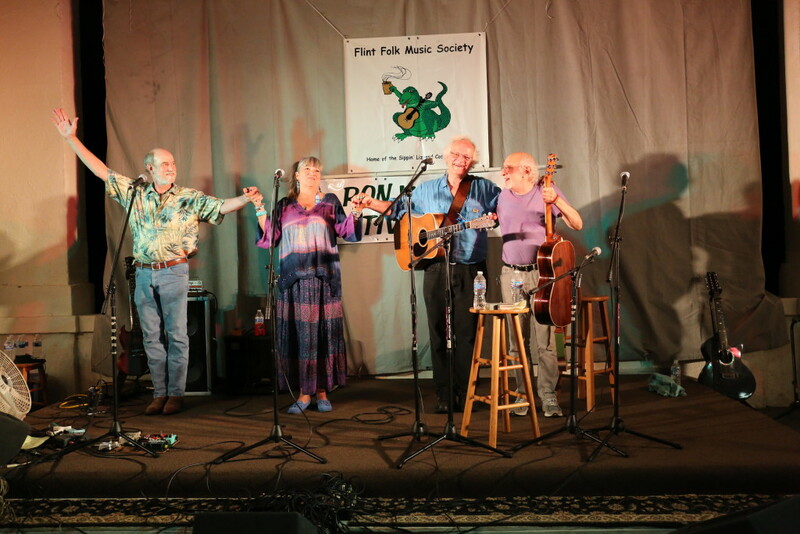 We were on tour with Peter Yarrow in Nov, and I hear him say, basically, we don’t do what we do because we think we are going to win: there are always defeats. We do it because it is the right thing to do. And, lucky us! We found you, you found us…and it has been a career and an astounding life. Here’s to keeping up the hope in 2016, and getting a little more involved: we all have a lot to offer, and we all make the difference when we step up. Next weekend we are back at it again! We are very excited to be going back to Hinsdale, and the gorgeous church where these concerts are held. Then on Sunday Jan. 10, we will be back in MI at the West Bloomfield Twp Public Library for a 3 PM show http://www.wblib.org/ NOTE THE EARLY SHOW TIME! I believe this is our first time playing this series! Blue Boat is a fairy new series, and has quickly established itself as one of the best series in the Chicago area. Jan. 23- back to WI!! Just north of Milwaukee, in Mequon, at the prestigious WI Singer/Songwriter Series http://www.wsss.org/ We have played here a number of times over the years: so great to be going back! Then the first weekend in Feb..out to NJ! They have been in existence nearly as long as we have been playing together: they started in July 1975, and we Michael and I began sining together in July 1974 🙂 A great place, great organization…please come see us if you can! Really, it doesn’t get better than this. Peter is a living legend, justifiably so, and his shows are filled with humor, empathy, hope, insight…and on this night, a little Mustard. or fine us on Facebook for even more up to date ( hopefully) news, photos, chat! FYI- the photo was taken last Summer at the Flint Folk Festival by Katie McTiernan, with Libby Glover and Peter Yarrow!